November | 2011 | I have to write something EVERYDAY?! The Texas vs. Texas A&M rivalry ended last Thursday (for the foreseeable future) after 118 years. Final score, Texas wins 76-37-5. Most importantly, Texas won the series finale at Kyle Field 27-25. The game was incredibly exciting. To summarize, A&M got ahead early, but Texas took advantage of a muffed punt return and a trick play to go into halftime down 16-7. Then Texas intercepted a pass, returned a punt 80 yards, and returned another interception for a touchdown which resulted in 17 points. A&M kicked a field goal, and then with less than two minutes left in the game scored a touchdown to make score 25-24 in favor of A&M. Texas defense was able to stop the 2-point conversion. Then Texas drove down the field, capped by a 25 yard run by Case McCoy into field goal range where Justin Tucker (a Westlake grad) kicked the winning field goal as time expired. The game was incredibly exciting and I was extremely nervous, especially at the end. It’s sad to think that the rivalry won’t be played every year in the future, but I’m not too upset. A&M chose to leave the Big 12, so I’m satisfied with sending them out with a loss. Two-day-week! Two-day-week! I could really get used to this. There wasn’t a whole bunch of academic learning that went on this week since we were only in school for two days, but the munchkins did get a lesson in the first thanksgiving. On Monday, we journeyed from England to America on the Mayflower. I turned off all the lights, had the kids sit down on the carpet with all their worldly possessions (their backbacks), and pretend that they were travelling to another land. When they got hungry…I gave them the hard tack that I made (flour + water = bland). When the water got rough, I sprayed them with water. When they got tired, half stood up while the other half “went to sleep”. When they had to go to the bathroom….I let them use our bathroom. (authenticity has its limits) Then they all wrote about their voyage. On Tuesday, we learned about the first thanksgiving, talked about why the pilgrims were thankful (this was obvious to them, due to Monday’s lesson), and had a cupcake party! On Wednesday, I got to cooking. I made my grandmother’s yummy yummy carrots. They are tangy and a bit sweet and very autumny. While carrots are cooking (and they cook rather quickly) mix remaining ingredients, pour over carrots, let set 12 hours or more. Will keep 3 to 4 weeks in refrigerator; good with most meats and fowl. On Thursday, we drove, then ate, then drove, then ate, then drove, then ate, then drove, then watched UT send A&M to the SEC with their head hanging low! then drove, then went to bed. I’m pretty used to these holidays by now, so I’m going to be pretty sad when I go back to school and there is nothing to look forward to for three whole weeks. Fortunately, my job is entertainment in and of itself. This week has been a normal-length week, but since it is sandwiched in between a couple of two-day weeks, so this week has been aptly named (by one of my teacher friends) as: the lost week. Well, first grade has made the best of it. In language arts, we’re talking about author’s purpose: whether to entertain or to inform and beyond that: to inform by explaining, telling about, or telling how to do something. We’re also making word lists with blends. So far, we’ve done s-blends (step, scratch, swim), l-blends (cloud, flower, please), and we’re halfway through r-blends (create, braid, princess). Some of the words that these kids are thinking of are incredible! So proud of my brilliant munchkins! In math, we finished up quick addition with only moderate success. The kids are getting faster on their facts, but when their taking a test, there really isn’t a penalty for going slowly (and thus being able to count on your fingers). I know that the kids will get better from the sheer convenience of having addition facts memorized. In social studies, we’re studying authority figures and the rules that they make and enforce. Kinda boring. We also practiced location. Disaster. Science has continued to be the highlight of the day for most students. We’ve talked about light energy (light lets us see things), sound energy (sound lets us hear things), and heat (heat warms things). They’ve done a lot of neat explorations including going to sound stations (tapping, strumming, shaking) and describing the sounds they hear when the interact with the objects. Also, we all went outside to feel the things that the sun warms. Those kids were entertained for over half an hour just by touching gutters and sidewalks and grass! They were also very diligent writers during all the observational excitement. Sometimes, you just get a hankering for something. That happened to me…yesterday. I suddenly wanted Doritos. Unfortunately (fortunately?) I wasn’t think of it when I went by the gas station by my house, so no Doritos. But! Today I remembered and indulged myself. It was intense! My mouth got numb because I’m not used to such a salty-artificial-flavor-nacho-cheesy gustation. But it tasted good anyway. Ugh- Today was a very rainy day in Austin. That makes my munchkins all hyper. When the first, distant crack of thunder (this week’s spelling bonus word!) was heard, the class began excitedly chattering. Then it began to rain and everyone rushed to the window. During their special area time, I was in the library working when I heard a crash of lightning that sounded like it hit the building or the pavement outside. It was jarring. One minute later: everything went black. If the munchkins were excited about the rain, I was imagining the pandemonium that was going on for their teacher. Darkness continued through lunch and into the next period before the power was finally restored. Order, however, was never really restored. I can totally understand it, but it was still a tiring day. Ouch!-I have a canker sore and when I chew, my teeth hurt. I tried lentils for dinner but they were still too crunch and irritating, so I am now feasting on strawberry oatmeal. Aww…-Our boring fish, Tilly, is dying. She became sick about a week ago and she is slowly fading out of this life. It is horrible to watch her suffer. She just lays at the bottom of the tank with her head on the rock and her body floating above. Jack and I are trying to determine the most merciful course. I really don’t want to euthanize her, but that might be what is needed to put her out of a long drawn out suffering. I just wish I knew how much longer she would hang on. This week was super short (only two days) because we had Monday and Tuesday off, and Wednesday was a school-wide field trip. 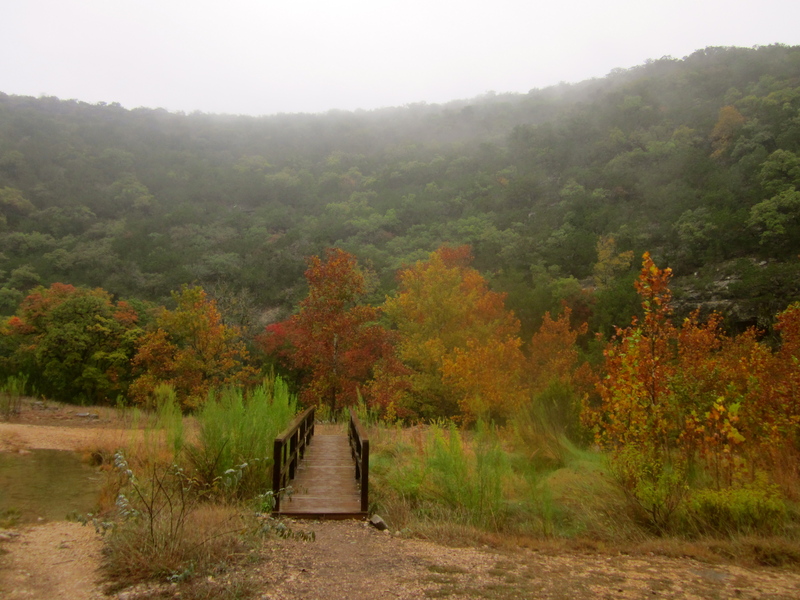 On Monday and Tuesday, Jack and I went camping at Lost Maples State Park and then spent the evening and next morning in San Antonio. 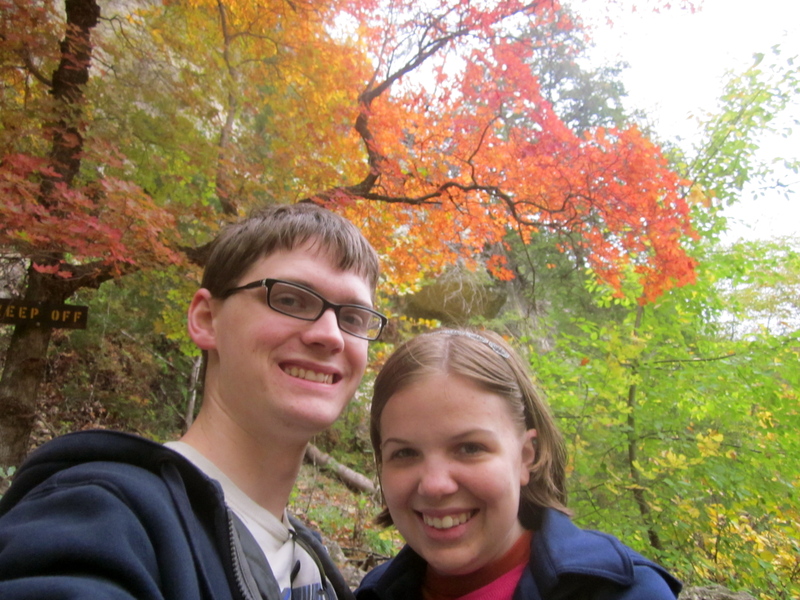 We saw some of the most beautiful colors! On Wednesday, the entire school trooped to a ranch to enjoy time together. The kindergarten and first graders: played on a giant playscape, climbed through a maze, rode on a zipline, played in a tire swing forest, played in a field with teepees and a fort, had a hotdog lunch, went through an obstacle course, played a giant game of duck duck goose, and played mini-golf. They were pretty tired by the end. And by tired, I mean that they all fell asleep within the first five minutes of getting on the bus. On Thursday and Friday, we began to talk about author’s purpose(why did an author take the time to write this book? inform or entertain? ), wrote about our holiday experiences, practiced memorizing our addition facts using doubles and near doubles, talked about authority figures in the home and how they take care of us, and learned about sound energy. The kids had lots of great questions like: How can you hear what you say? How does sound travel? Why does sound get bigger when you get closer? 1. you need strongklos (strong clothes). You need helmits. you need rover (a Mars rover). you need a rockitship. you need ushigin (oxygen). you need a flag. you need food and watr.